ST. JOSEPH - For a short time, a devastating earthquake drew the world's attention to impoverished Nepal and its efforts to recover. Since the April quake, attention has strayed as other crises emerged. The plight of the Nepal's people hasn't fallen off the radar of St. Joseph native Diann Grimm, whose nonprofit organization, Partners in Sustainable Learning, has built schools and trained teachers in remote villages since 2012. She and partner agency Volunteers Initiative Nepal have taken on the almost herculean task of helping Nepalis rebuild their homes and schools. And they want to do it right. "These children are important enough to be in buildings that are safe," Grimm, a 1972 graduate of St. Joseph High School, said during a visit this week with her mother, Eleanor Grimm, in St. Joseph. Grimm was in Kathmandu when the quake hit April 25, having just completed a three-week mission to Nepal's mountainous inner regions. She was unharmed and made it back to her California home safely, where she anxiously awaited reports on the welfare of the people she had worked with and befriended. Across Nepal, 8,800 people died as a result of the quake, and many were left homeless. Her colleague, Bhupendra Ghimire, head of VIN, went into the countryside the day after the earthquake on his motorcycle to survey the damage and aid recovery efforts. In the first two weeks, three early-response health camps were set up, treating 150 villagers. Food, tents and carpets were sent to a local orphanage, and 600 tarps were distributed to protect homeless people from the coming monsoon rains. In the following weeks, health camps treated another 550 people with mild to serious health problems. VIN volunteers hosted a 15-day camp of games, music and dancing for children to help them overcome the psychological trauma of the earthquake and the strong aftershocks. The Okhaldhunga district, where Grimm's educational efforts had been focused, escaped major damage from the first quake, the worst in 80 years. But on May 12 a 7.3 tremor, centered closer to Okhaldhunga, hit the area and did greater damage. In the region, 150 houses, made of stone and mud, became uninhabitable. Of the 30 classrooms Grimm set up, four were destroyed and five sustained heavy damage. They will support the construction of nine temporary classrooms to replace the damaged schools, she said. Several teachers trained by Grimm's organization lost their homes, as well. But they showed their resiliency and within days were back teaching young children, out in the open under trees. The tarps that sheltered entire families wouldn't keep out the torrential rains, and villagers couldn't cook inside of them. The two agencies worked to get people into transitional shelters built with woven bamboo and tin roofs. To date, Grimm's organization has helped build 75 of these houses, sheltering 117 families, at a cost of $15,000. Bhupendra Ghimire used the disaster as an opportunity to provide training for villagers, hiring young men and women to learn construction skills under the tutelage of an experienced builder. He organized 13 teams, with two families volunteering with each team. Unskilled workers were paid $3 a day, and skilled workers earned $10 an day. The simple design allowed each shelter to be erected in three days, at a cost of $200 each, including material and labor. In gratitude, the villagers adorned their walls and doorways with the initials VIN and PiSL. Rebuilding in Nepal's more remote areas won't be easy, Grimm said. Two-thirds of the classrooms where she worked aren't near roads, and material will have to be carried on mountain paths. Grimm said she has been encouraged by the response to her calls for aid. One school in San Mateo, Calif., where Grimm had talked about Nepal before the earthquake, raised $8,250 for relief efforts through jog-a-thons, read-a-thons and other activities. One girl sold grapefruit she picked from a tree in her yard. A little bit can go a long way in Nepal. A $50 donation can buy eight bags of cement, and $100 can help repair a classroom. A donation of $2,000 will build a classroom to local building standards, according to PiSL's website, and $5,000 will build an earthquake-resistant classroom. Donors can sponsor a teacher for only $38 a month. Grimm is ready to go back to Nepal, and is planning a trip in November with her husband, Dan Schwab, and friends. Her commitment to Nepal remains unshaken. "People ask me if I'm afraid to go back. I'm not afraid to go back. How can I not go back?" Grimm said. Residents of the Okhaldunga district in Nepal retrieve their belongings from their destroyed home after a May 12 earthquake, which followed a major quake and strong after-shocks in April. 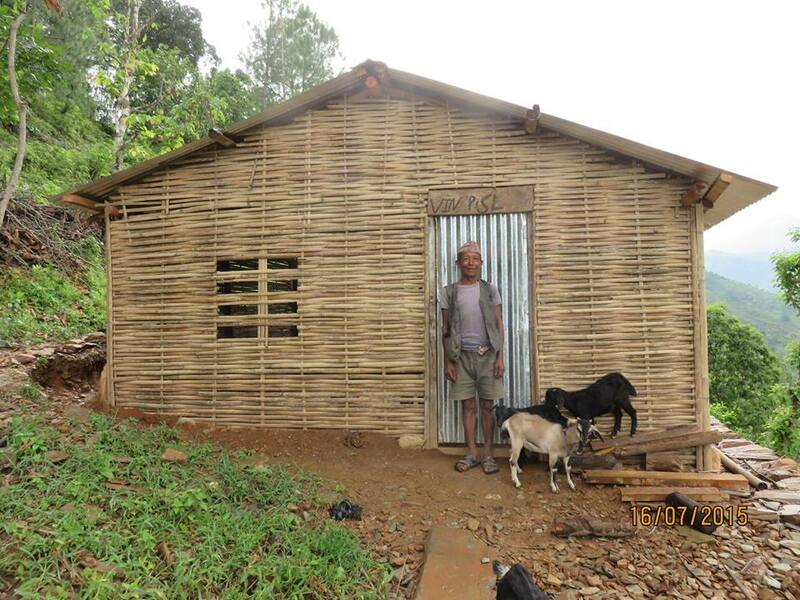 Khil Bahadur Thapa of Bhadaure VDC in Okhaldhunga District of Nepal stands in front of his family's new transtional shelter built by VIN workers and financed by PiSL.